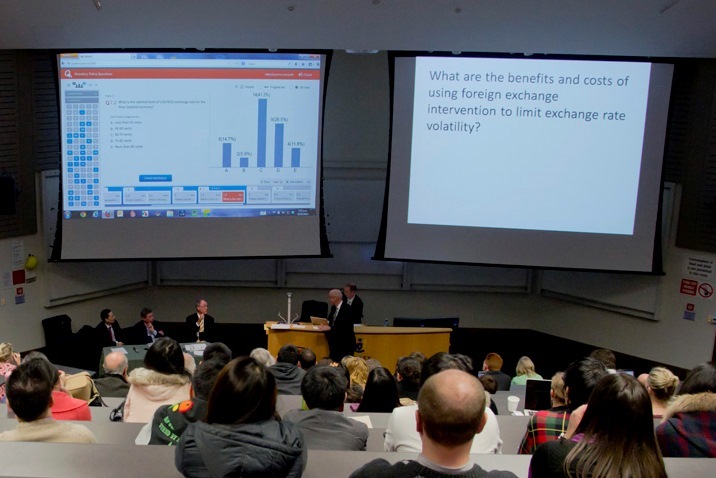 On July 30th, Massey University’s Business Student Group brought together four economics experts, including former Reserve Bank governor Dr Don Brash, to discuss some of the biggest economic issues New Zealand currently faces. Associate Professor Russell Gregory-Allen and Dr Sasha Molchanov from the School of Economics & Finance organised the questions for panelists and audience, and ran Xorro-Q during the event with Associate Professor David Tripe as MC leading the panel discussion. Preceding the event, the audience was asked to use their personal browsing devices to complete a short personal profile using Xorro-Q. – What are the main monetary policy challenges facing the Reserve Bank at the current time, and what impact are these challenges having on the banking sector? – What impact will the implementation of the Reserve Bank’s proposed macro-prudential rules have, including on homebuyers? What are the strengths and weaknesses of alternatives to the suggested approach of limiting loan-to-value ratios (LVRs)? – What are the benefits and costs of using foreign exchange intervention to limit exchange rate volatility? – How successful has the partial sale of Mighty River Power been? What lessons does it provide for future partial floats of other state-owned enterprises? During each topic, the audience was able to submit questions for the panel to consider; these were moderated by Dr Sasha Molchanov. Following each topic the audience responded to a short batch of questions; audience response to these questions became the subject of lively debate among panelists. The audience agreed that the high NZ dollar exchange rate is the most pressing monetary policy challenge facing New Zealand today. When polled about what the optimal level of the NZ/USD exchange rate should be, 40% of the audience selected the 60-70 cents range, while 22% argued it should be lower. Few in the audience (4%) expressed the view that Auckland’s housing market should be left to follow its own course. The intervention most preferred by the audience was introduction of capital gains tax (29%), followed closely by an increase in the housing supply (25%). The evening closed with a brief poll of the audience to gauge their views on the event’s success. 93% of the audience felt the event provided excellent or above average interest, and 78% of respondents felt use of Xorro-Q played an important or very important role in making the evening interesting for them. Our congratulations go to Associate Heads of School Dr Jeffrey Stangl and Assoc Professor David Tripe, the dedicated team from Massey University’s School of Economics & Finance, and to the Business Student Group led by Jonathan McDonald, for organising such a memorable evening for the large audience.